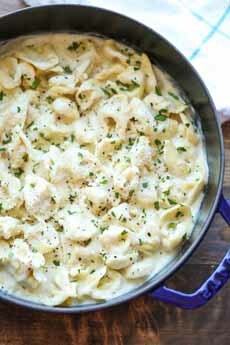  Tortellini alfredo. Here’s the recipe from Damn Delicious. 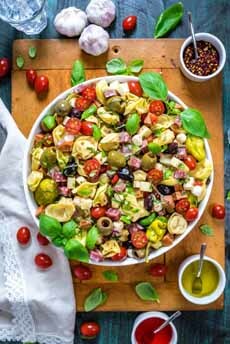 Tortellini antipasto salad. Here’s the recipe from Host The Toast. 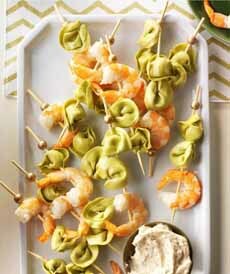 Tortellini and shrimp skewers. Here’s the recipe from Taste Of Home. 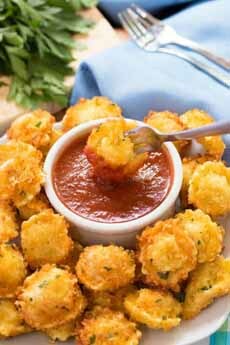 Fried tortellini bites with marinara sauce dip. Here’s the recipe from The Cozy Cook. February 13th is National Tortellini Day. Most people think of a dish of tortellini with their favorite sauce. But tortellini can be so much more. Here are 20 ideas for lunch, dinner and hors d’oeuvre. Tortellini are made by filling long strips of pasta, rolling them into tubes and cutting individual pieces, which are pinched together with the thumb and forefinger. The famous “loop” shape is said to be based on the belly button of the Venus, the Roman goddess of love. The gods spent the night at an inn in Castelfranco, a small town located between the two cities. Tortellini en brodo was the traditional Christmas soup, made with capon broth, which was favored by the ruling classes. The broth was made rich by cooking all the meat in it. The meat was then turned into a stuffing with Parmigiano-Reggiano, prosciutto crudo and/or mortadella. Both tortellini and ravioli are what is known as “pillow pasta”: stuffed pasta that is pillowy, compared to long strands (spaghetti, fettuccine, etc.) or short cuts (bowties, wagon wheels, etc.). Tortellini translates to “little stuffed cakes.” A single layer of pasta, topped with a filling, is folded into a hat-like shape. The singular form is tortellino. Ravioli, the plural of “raviolo,” translates to “little turnip.” Ravioli is two layers of pasta with a filling in-between, that form a pillow-like shape. FOR MORE PASTA SHAPES, CHECK OUT OUR PASTA GLOSSARY.